Hello and Happy New Year! Thanks for checking in with us regarding the Big Bear real estate market. 2017 was an incredible year for real estate in Big Bear. Let’s get caught up on what transpired and also speculate on what this means for the market going forward. The average price of all residential homes sold in Big Bear in 2017, as compared to 2016, increased by a significant 8.3%. 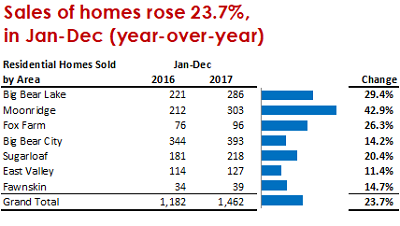 But even more impressive, the total number of residential homes sold in 2017, as compared to the year prior, increased by a sizable 23.7% (1,462 in 2017 vs. 1,182 in 2016). Sales of homes above the $500,000 mark improved by a remarkable 53%. Although keep in mind that, the total number of sales above $500,000 combined make up a small part, only 12%, of the overall market. To what can we attribute this surge in demand? Interest rates remaining at historically rock-bottom levels throughout the year certainly didn’t hurt. And for the market moving forward, a significant increase in mortgage rates would surely be the wild-card as when (and I say when, not if) they do eventually rise, this will undoubtedly dampen the potential for continued price appreciation. But in addition to low-rates, the positive buzz of Aspen Ski Co. buying our two local ski resorts, Big Bear’s booming vacation rental market (while other areas like Tahoe and Coachella Valley are looking to ban or drastically limit rentals) and the stylish improvements to The Village area undoubtedly helped as well. However, I believe it is the intrinsic value that real estate in Big Bear offers that is the driving force behind the strong demand. 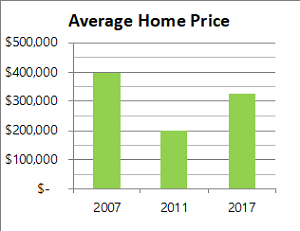 At the height of the market, the beginning of 2007, the average price of all the homes sold in Big Bear Valley was just over $400,000. At the very bottom (Q3 of 2011) the average price dropped to just over $200,000. 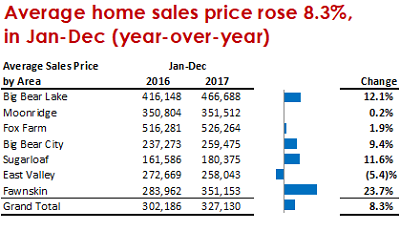 In 2017 the average price increased to $327,130. So, as we begin 2018, Big Bear has recovered roughly 60% of the drop from the 2007 high. As the charts above show, some areas have appreciated more than others. So, if you are interested in the specific top-dollar value of your property, please do let me know. To put Big Bear's recovery into perspective, the overall median price in the six-county "Southern California" region recently surpassed the all-time highs seen in 2007 ($507,500 in December 2017 vs. $505,000 which was the previous high seen in 2007). It is typical for there to be a lag in the Big Bear real estate market as compared to coastal communities and the "owner-occupied" markets down the hill. But along with Big Bear being slower to recover comes opportunity. Based on where the market in Big Bear sits right now, it is no wonder that demand for investing in real estate in beautiful Big Bear is on the rise. And I expect to see this trend continue in 2018. It is encouraging to see that Big Bear’s current real estate market, with strong demand and solid price appreciation, still has a good way to go before approaching the peak seen at the end of the last "bubble" market. But as we travel down this road this time around, the big difference is that over-borrowing is not the force driving the market forward. As such, the trek back is slow and steady, but this in turn makes the gains realized much more sustainable. Lastly, there has been plenty of concern recently, and rightly so, regarding the new Federal Tax Plan and how it will affect second home markets. My personal take on this with respect to Big Bear’s real estate market is that, while the changes are not positive, I don’t foresee a huge detrimental impact from them either. When the first draft was published, it looked scary indeed for a second home market like Big Bear, as the mortgage deduction on second homes was reportedly being completely discontinued. In addition to enjoyment-of-use and potential appreciation, the tax benefits of owning a second home in Big Bear weigh heavily for some in their decision to make a real estate investment here. And although the new limits on state income and property tax deductions might increase the overall cost of owning real estate for some, the final version of the new tax plan, thankfully with many of the scariest changes removed, looks to have a lesser impact. Perhaps the market might not go up quite as much as it would have had these changes not taken place, but I personally don’t see this new tax plan as likely to take the legs out from under our market here in Big Bear either. Whew, plenty to catch up on in the new year. Thank you for taking the time to read my update. I hope you find the information useful and we will continue to keep you posted on the market in 2018. Please do let us know if you have questions on any homes you see for sale here in Big Bear, as we have access to all and look forward to helping you find and buy a great property. Or, if you have any questions on the market or the current value of your Big Bear property, again, please do let me know. We are happy to help and look forward to hearing from you. Until next time – All the best. Posted in 2018 Posts on February 1, 2018 by Mike Sannes.